A 33-year-old man from La Mirada was found trapped under a truck on the 91 Freeway going eastbound on his motorcycle during rush hour. The first witness initially thought that the truck’s bumper was loose, but after a closer inspection, he realized that there were human legs on the front end by the tires under the truck. The California Highway Patrol indicated that the driver of the motorcycle sideswiped a vehicle, fell off the bike, and landed on the road. The driver of the truck was unable to stop timely and the truck ultimately landed on top of the motorcyclist. The first witness exited his vehicle while in the middle of the freeway and joined others who came to help the motorcyclist who was trapped under the truck. The crowd of Good Samaritans gathered and used jacks to lift the truck and save the motorcyclist. The crowd found the motorcyclist in a tremendous amount of pain with a tire on top of his leg and the rear axle on top of his lower back. Two jacks were used to save him. One was on the truck’s front axle and the other was on the rear axle. 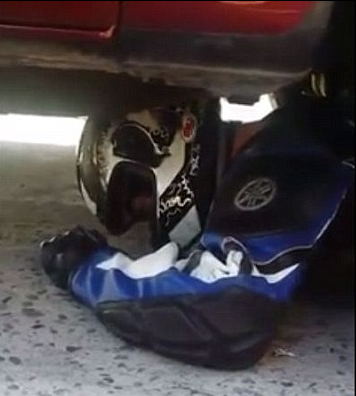 Ultimately, the Good Samaritans were able to free the trapped motorcyclist by pulling him out by his legs.